Please refer to our stock # B-16 when inquiring. 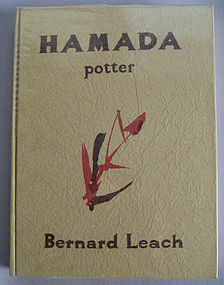 "Hamada Potter" by Bernard Leach. 1975 First Edition, Kodansha. Hadmade paper bound hard cover with original plastic dust cover. The book is bound with hand-laid paper from Fukui Prefecture coated with pine resin sizing. The titling on the cover and spine was silk-screened with natural Japanese lacquer by Wajima Craft, with the held of the lacquer artists Keisuke Ichinaka and Isaburou Kado. The image is Hamada's signature broken sugar cane motif which adorned so many of his pots. 305 pages with color, B/W plates, and illustrations of pots and Hamada design sketches. Condition-good. Small dents (1 & 2 cm) on top & bottom of back cover. Interior book binding condition - new. "Shoji Hamada and Bernard Leach are among the most important figures in the ceramic world of this (20th) century. They have established standards of craft in their own countries and have influenced artist-potters everywhere. Although Hamada's work is internationally famous, his life, his ideas and techniques are still not widely known. In this profile, Leach has captured Hamada the whole man, his friend of over fifty-five years. Tape-ecorded interviews made in 1973, material selected from all of Hamada's published writings, and numerous letters are blended here into a dialogue between the two men, with occasional interjections by key people in their lives. The dialogue traces Hamada's development from the first crystallization of his aim to be a potter until the present day, revealing his ideas on materials and techniques, his insights into work and aesthetics, and his unique way of life. The first book in English to include a large selection of Hamada's best pots, this volume goes beyond biography or technical exegesis: it opens a window onto the creativity of a potter who points a way for the craft world today."